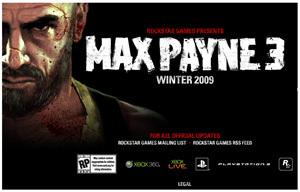 Vancouver – Rockstar Games, a publishing label of Take-Two Interactive Software, Inc., is proud to announce that Max Payne 3 is currently in development at Rockstar Vancouver and is scheduled for a winter 2009 release on the Xbox 360® video game and entertainment system from Microsoft, PLAYSTATION®3 computer entertainment system and PC. Developed by Rockstar Vancouver, Max Payne 3 tells the story of a retired police detective embroiled in a world of corruption, turmoil and intense violence. Max Payne 3 will be available in winter 2009 for Xbox 360, PLAYSTATION 3 and PC. This entry was posted on Monday, March 23rd, 2009 at 5:44 pm and is filed under Action Adventure, Rating Pending, Upcoming Releases. You can follow any responses to this entry through the RSS 2.0 feed. You can leave a response, or trackback from your own site.